This is a 21 day programme for fat-loss, good nutrition and training. 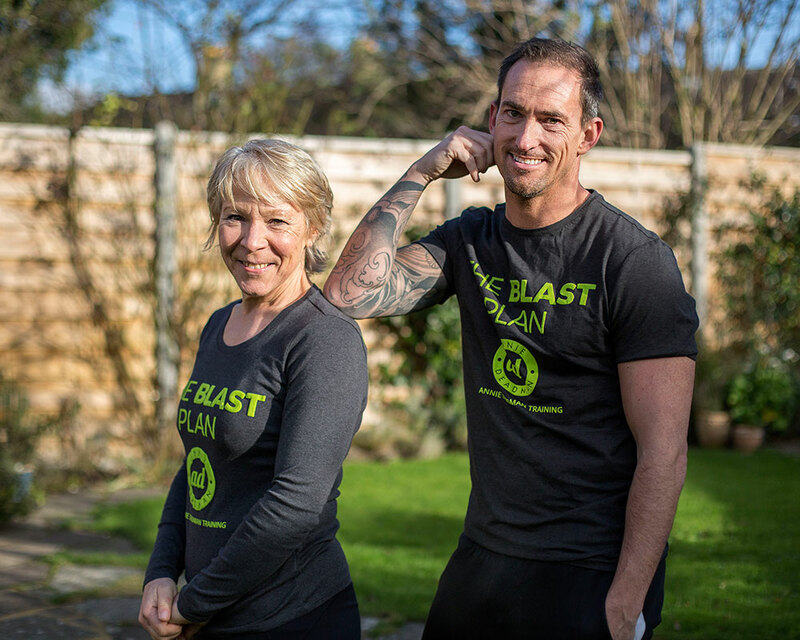 We also run this as an online plan (visit theblastplan.com). This plan is exactly the same, except you physically attend group fitness training classes in Hampton and Hampton Hill area. 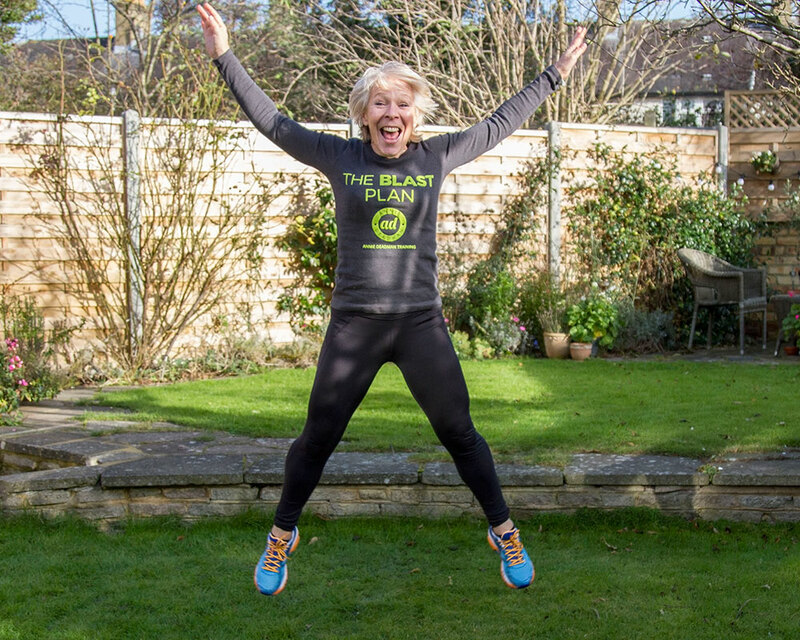 To get onto the In-Person Blast Plan, you simply email Annie to enquire about spaces and to check whether this is the right programme for you. Once you’ve paid, this will secure your place. A couple of days before the official start date of the Blast plan, you will be sent your Blast pack by email. This contains your eating guidelines, recipe collection, measurement sheet etc. 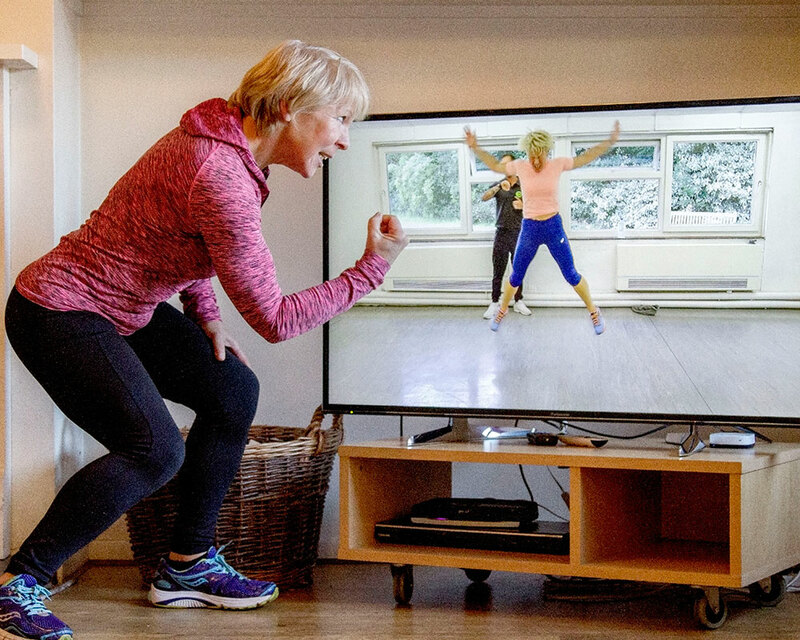 You follow these guidelines and you attend as many of the group training sessions in Hampton and Hampton Hill each week as you like, according to what fits in with your lifestyle (see timetable). During the course of the 21 days, you will receive each day an email from Annie. This will contain information about the body, about health, nutrition and what it takes to stay in good shape. They will also entertain you and form a vital part of your adherence to the Blast plan. There is a private Facebook group for you to join too. 2) What can I expect to achieve in 21 days? Extensive knowledge and understanding about your body as well as a lost of between 5-12 inches over 5 measuring places. You may also lose weight on the scales. That does depend how heavy you are in the first place. You will realise that your loss of fat is determined by your loss of inches, not by the number going down on the scales. 3) What is the Blast eating plan like? The Blast eating plan works because you will be creating a non-toxic environment for your body. Some foods which traditionally aggravate the gut (sugar, alcohol) are omitted and you will be nourishing and fuelling your body with good normal food. Nothing weird. You are encouraged to eat more protein and your carbohydrate (oats, potatoes, rice etc) quota will be offset by your workouts. You will be given all the instructions you need (including a shopping list) and you shouldn’t be hungry. You will be inspired by the Blast recipe collection, but you have the flexibility to cook your own food using the Blast guidelines. The food you will eat is good, unprocessed food which can easily be adapted into family life. 4) What are the workouts like? From the timetable of classes run by Annie Deadman Training, you choose as many as you like. You should do a minimum of 4 classes per week. They range from Bootcamp (a mix of strength work and cardio), Circuits (a mix of strength and cardio using varying bits of equipment), Boxing (you should arrive 10 minutes earlier before class to receive some pad handling training), plus our Strength class involves no cardio at all, and just focuses on getting the most out of your muscles. 5) What is the level of support like? Annie and Aaron are Blast leaders and you will see them at your classes so you may ask anything at any time. You will also be able to email them at any time and you will get a reply the same day. One of the great things about the Blast plan is the community feeling that everyone is doing it together. Everyone on the In-Person Blast plan (plus the Online Blast members) all receive the same daily email plus there are Facebook groups to share stuff and ask questions. The Blast leaders post here too. 1) Can I have a free session to start? Yes, of course! If you are unsure of whether you want to join the classes, then simply email Annie and book a free taster session of any classes which interest you. If you are brand new to exercise, please don’t be worried. We are all very inclusive and the classes have a variety of fitness levels. You may book 1 class a week. Or up to 3 classes a week. Or unlimited classes per week. We operate in ‘terms’, roughly in line with state school term times. That means that payment would be required for that term. You may divide your payment into two and pay half at the beginning of the term, and the other half half-way through the term. Just ask Annie. You may also swap around your options. Within any one term, you may book 1 class a week for 2 weeks and 3 classes a week for 4 weeks. A minimum of 4 weeks booking (of any class option) is required within any one term. No joining fee, no direct debit, just great training at practical locations with people who want to train and get results. 3) Do I have to do the same classes each week? You can swap around your choice of classes each week, any week. For example, if you have booked on the 3 classes a week option, then one week you might do Wednesday Circuits, Friday Bootcamp and Saturday Boxing. The next week, that might change. You don’t have to let us know, you just turn up. We thought you’d never ask! Please read our terms and conditions. 1) Why should I do Pilates? Pilates can do a number of things. The exercises are designed to help you learn how to isolate the right muscle to do the right job. As we go through life our bodies get used to a certain way of sitting or walking which isn’t necessarily comfortable or correct. Some muscles therefore do their own job but also that of other muscles which have become weak. Performing Pilates exercises will help you identify these weaker muscles (say, your glutes) and we will learn how to strengthen them. Pilates therefore will lengthen the tight and strengthen the weak. Pilates also focuses on improving mobility and flexibility. During each exercise you will be using and strengthening your core. 2) Does it involve any jumping or high impact moves? No! You will spend a good bit of the time on a mat with varying pieces of equipment (all supplied). You may also do some standing exercises. You will work hard, both at the moves and at your focus. So best not to attend these classes if you are looking for a nice lie-down at the end of a day. 3) Should I attend the Beginners Course first? The regular classes (intermediate) are only for those who have some experience in Pilates. If you are totally new to it, then you should attend one of our Beginner’s courses which are held throughout the year. Usually a 5 week course, the sessions will ensure you get a good grasp of basic Pilates skills so that you understand why it is a good discipline to practise regularly and how it helps your body become more efficient and contributes well to any other fitness activities you do. Once you have completed a Beginner course, it will be at Annie’s discretion whether the next level of class is suitable for you. Please read our Terms & Conditions. And contact Annie if you would like to check the availability in classes or to find out more about them. 1) How can I get started? Personal training is a fantastic way of meeting your own specific needs. You will build up a rapport with your trainer and together you will be working hard to make sure you achieve what is set out. Simply contact Annie with a brief outline of your goals and your preferred times. We will see what availability there is, and the allocated PT will get in touch to get some details from you. The minimum is once a week. This shows us you are committed to change and improvement. You may book just one session at first to see how you get on. After that the minimum bookable upfront is 5 sessions. These must be paid for in advance. Personal Training cannot be paid for on a pay-as-you-go basis. 2) Will the personal training include a nutrition plan? Yes, in most cases, it will. You will be expected to keep a food diary and show this to your PT on a regular basis. 3) How will I make progress? Through regular checks on nutrition, fat measurements and fitness and strength tests. The PT may modify your nutrition and your training regularly in order to keep the body in a state of progression. He/she will take into account any other training you do. Contact Annie to find out more.